Download Restaurant Food Menu Flyer Free PSD. Are you looking for Restaurant Food Menu flyer designs? This Restaurant Food Menu Flyer Free PSD can be used for promote your restaurant, cafe, fast food, steak house, Catering, Grill bar etc. This Restaurant Food Menu Flyer is a two-sided design with an elegant design in the front and a well-organized food menu in the back. 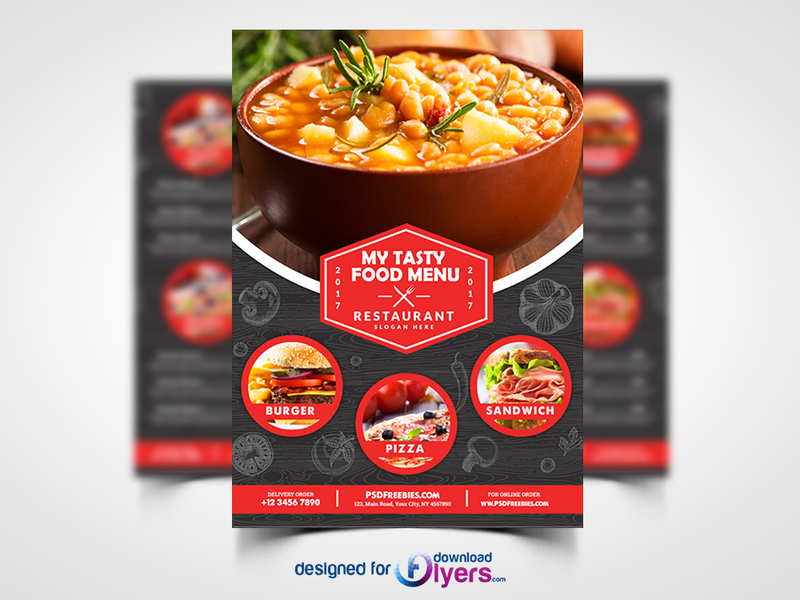 You are also granted an Unlimited Use and 100% Royalty Free License meaning you can use this Restaurant Food Menu Flyer Free PSD as many times as you wish for as many clients as you wish. You are free to use this Restaurant Food Menu Flyer Free PSD in both personal and commercial work. If you use this awesome free flyer template kindly give some credit to DownloadFlyers.com as well. So Download this print-ready and well-organized Restaurant Food Menu Flyer Free PSD file and use it as you like. This template download contains a 8.5×11 Size, 300 dpi print-ready CMYK 2 PSD files(Front and Back). Hope you like it. Enjoy!